Learn to defend your faith with “12 Points that show Christianity is True”. This foundational series that builds logically one topic upon the other in laying down a foundation of Truth. Access to this material is limited to 60 days. An abbreviated audio lecture of Dr. Geisler's popular teaching series “12 Points that Show Christianity is True”. This is a great foundational resource in Christian Apologetics. 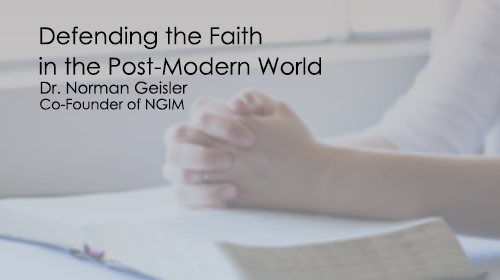 One of Apologetics most respected experts explains Post-Modernism and we can defend the faith in a Post-Modern world. This group is free to join. The rules are simple. We will choose a book to read every month. Each week there is a reflection question, and at the end of the month, we have a video conference for all those who can attend. Simple, easy, fun! Join us for Bible study live every month, and be sure to catch any studies you missed from previous months! Studies take place through video conference and cover a wide range of Scriptures to understand and apply the passages.